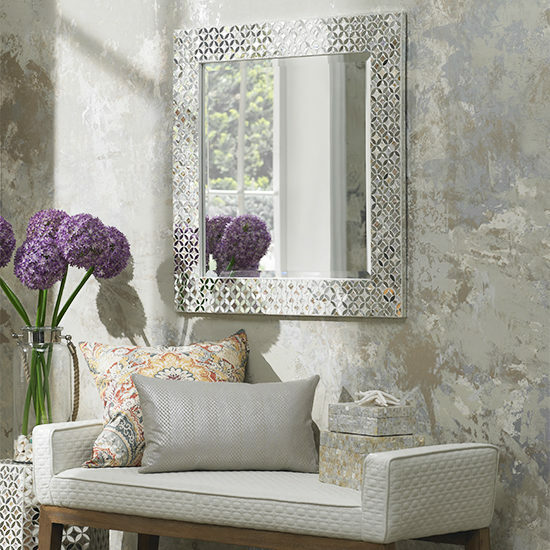 Decorative wall mirrors can add to or bring natural light to a space, reflect an important design element, provide visual balance, transform a look, or bring a unique touch to a space. Modern chaise with wood base under a rectangular mirror in a crystal adorned frame. Do you have a beautiful view out one of your windows? Reflect the vista so you can see it from many angles in a room with a mirror. An added bonus of placing a mirror near a window is that it magnifies the natural light in a space, a great technique for making a space seem bigger. A traditional dining room with a rectangular mirror with beaded trim over a sideboard. Do you have a design element in a room that you’d like to showcase even more? An eye-catching crystal chandelier for example? 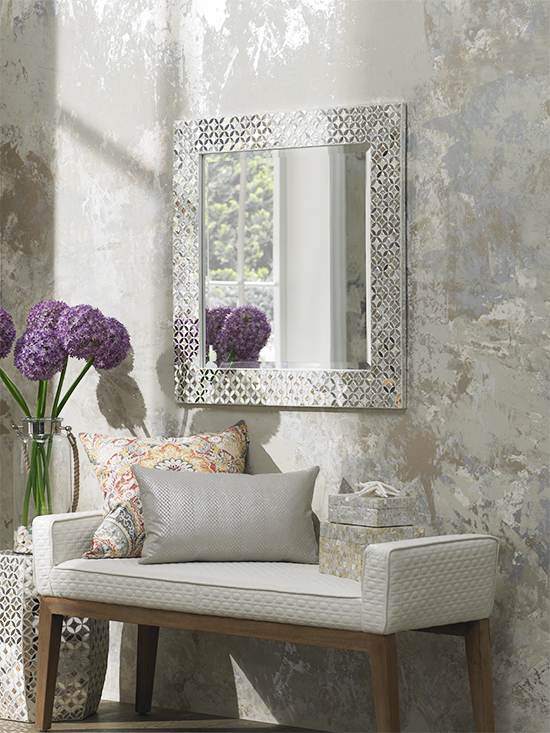 Hang the mirror in such a way that it reflects the sparkling fixture. Hanging a mirror so it reflects the light from a chandelier or pendant has the same effect as hanging it near a window as the light is amplified, which is perfect for a room with little to no natural light. 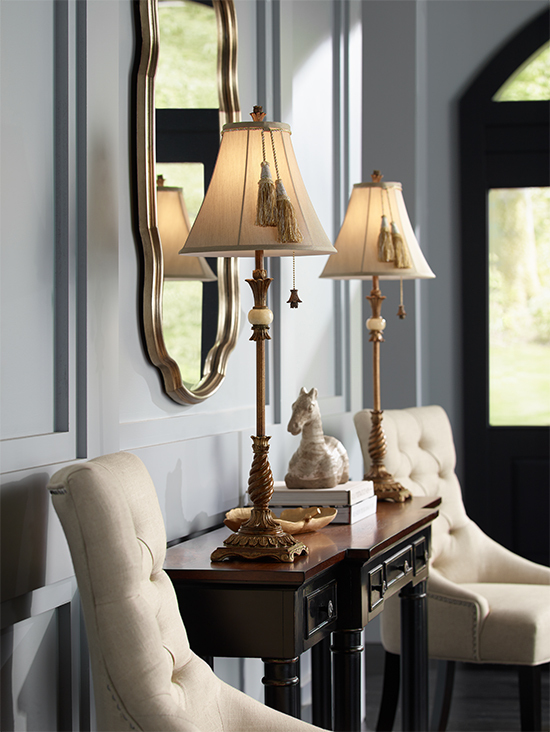 A traditional entryway with two buffet lamps on a console table flanking a gold frame wall mirror. 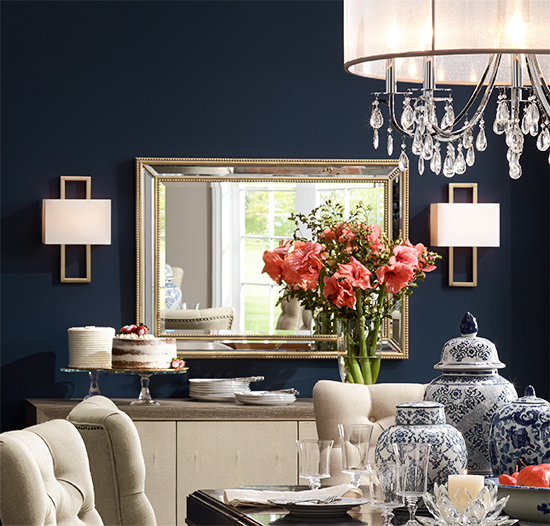 Provide visual balance over a console or chest in an entryway by centering a mirror above and flanking it with table lamps or sconces on either side. If you only want to use a single table lamp, balance the look by anchoring the other side of the console with a vignette of home accessories. A classic sunburst mirror is timeless, but you can make the look more modern with a console table with contemporary, sleek lines. 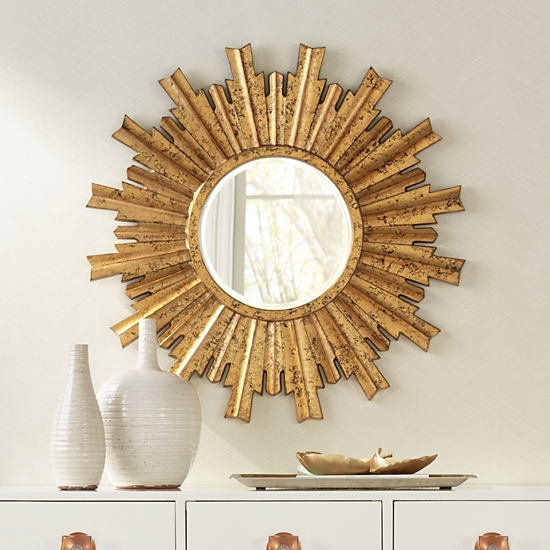 Mirrors don’t always need to be hung on a wall… Place them in unexpected places, like in the living room above where they are incorporated in the gold etageres along with styled home accessories. 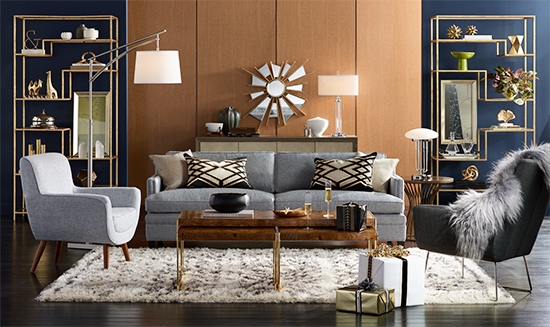 Contact us to speak with one of our friendly, professional Lighting & Home Decor Consultants or visit a Lamps Plus location near you. Whether via phone or in person, we’re happy to assist you in completing your project.